By undertaking and supporting projects such as these, we not only preserve Newtown’s past but provide for its future in the form of lasting documented resources. The Newtown Historic Association recognizes this need as becoming even more urgent as we move into the 21st century. Many of you have seen the Veterans Displays in the Newtown Hardware House window every Memorial Day. These poster boards of Newtown soldiers and sailors who served in World War II, the Korean War and the Vietnam War were made by Mike Donovan. Mike was a lifelong resident of Newtown, a dedicated NHA volunteer and proud veteran. The Memorial donations for Mike Donovan have enabled this project. Kathy Gonsalves and Lee Clark are the very able NHA volunteers undertaking this effort and fitting legacy for Mike Donovan. As part of his Planned Giving, Paul Kester left a bequest to the Newtown Historic Association. And thanks to Paul Kester, five new desktop computers and software have been added to the NHA Research Center in 2016. 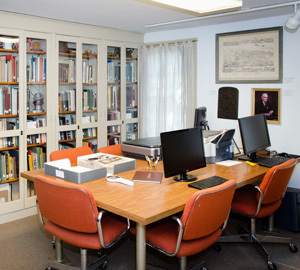 The Past Perfect software will enable cataloging of material for archiving and the computers are available for research and support of the organization. This gift has truly facilitated the work of the Newtown Historic Association and Paul’s legacy has enabled Newtown’s legacy. 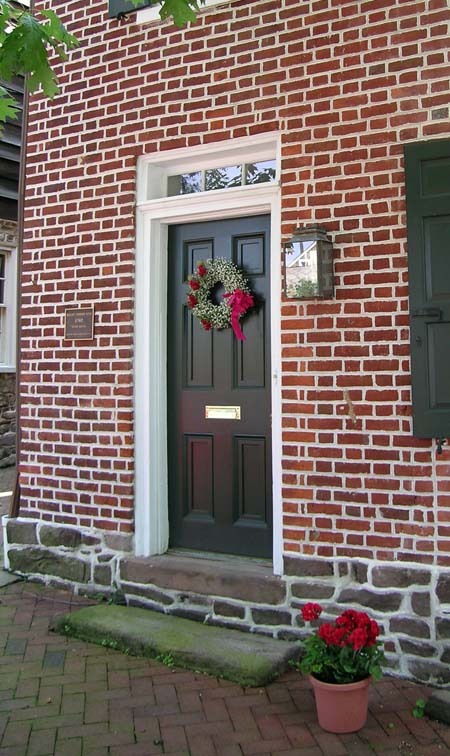 In 2014, the Newtown Historic Association was awarded a $4,000 matching grant from the Bucks County Conference and Visitor’s Bureau for repairs to the Thornton/Hicks House. The grant enabled the north wall of the building to be repointed. The building’s façade was restored in 2003 and now this additional repair work will help to maintain the building for the future. The Newtown Heritage Walk integrates historically significant sites along State Street (Borough) and Sycamore Street (Township). Each stop was selected because of its historical value to the Newtown community, featuring sites from the 18th, 19th and 20th centuries. The Newtown Heritage Walk project is a self-guided walking tour consisting of over thirty stops in Newtown Borough and Newtown Township. An 18” x 24” wayside sign has been installed at each stop that consists of a blend of text and photos. The Heritage Walk is modeled after similar wayside programs in Gettysburg, Harrisburg, Carlisle, the Delaware Canal, and other historic locations in Pennsylvania. Click here for more information on this project. 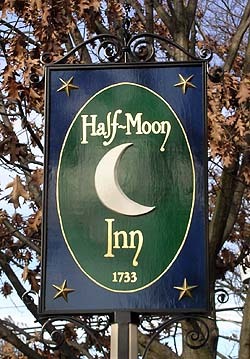 On your next visit to the Half Moon Inn (Court Inn), you will likely pass by our new “Half Moon Inn” sign. This wonderful new sign was recently erected in front of the Half Moon Inn (Court Inn), through the efforts of David Callahan, to signify the original name of the historic Inn. The sign design was re-created by Rosemary Tottoroto from an original sketch by Elizabeth Mayer and the handsome metal work was fabricated by Ray Mathis. 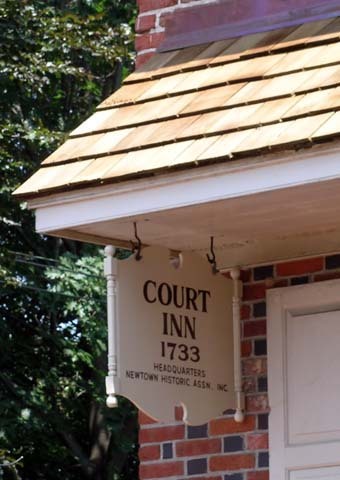 On March 2, 2007, the Court Inn was officially rededicated with a formal ribbon cutting and citation presentation from State Representative David Steil’s office as well as a matching grant award from the Newtown Main Streets Program. The Boone Garden, located across the street from the Half Moon Inn (Court Inn), has been undergoing a transformation over the past two years. This 2,100 square foot parcel was donated to the Newtown Historic Association from the late Grace R. “Missy” Boone in 1972 for the enjoyment of the community. 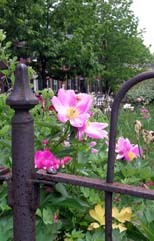 The first phase of the project was accomplished in 2006 for an Eagle Scout project that included refurbishing and repainting the wrought iron fence and removing the overgrown shrubbery and two stumps on the parcel. The second phase of the project was completed in 2007. With the help of a second Eagle Scout project, a wooden privacy fence, modeled after the fence at Carpenter’s Hall in Philadelphia, was erected between the restaurant property (the Grotto) and the Boone Garden in 2007. The ongoing maintenance of the Boone Garden is handled by a few interested members who volunteer many hours each year toward keeping the garden looking very nice. In 2004, the Newtown Historic Association was awarded a matching grant from the Bucks County Community Development Advisory Board in the amount of $12,925 specifically for roof repairs on the Half Moon Inn (Court Inn). This grant is the first step in raising the funds needed to enable work to begin replacing the 20+ year old roof of the Half Moon Inn (Court Inn). The Newtown Historic Association members, family and friends generously contributed to help match the support that was awarded from the county. In keeping with our mission, this project will enable us to better serve the ever growing and more historically conscious Newtown community through the preservation of our research and collections facilities to help us better meet our goals for the future. The Thornton/Hicks House renovation project was one of the more recent restoration efforts of the Newtown Historic Association (NHA). 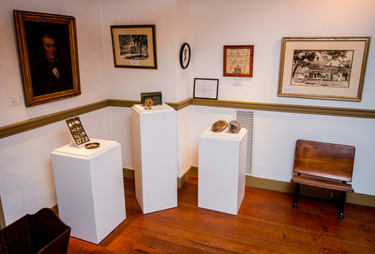 In 2002, the Pennsylvania Historical and Museum Commission approved a matching grant in the amount of $46,450 for the Thornton/Hicks House renovation project. The PHMC grant was the initial step in stabilizing, repairing and restoring the roof, chimney, upper front wall, and attic of the NHA’s latest acquisition, the Lauer property, which is located next to the Half Moon Inn (Court Inn) in Newtown Borough. The balance of the funds needed to complete this project was raised through generous donations from the community. Renovation and construction work was completed in 2003 and the building is now in much better shape. Looking toward the future, the research and collections facilities will eventually be expanded into the Thornton/Hicks House. Therefore, we are asking for your tax-deductible financial support to maintain this facility and provide a firm foundation for the future. 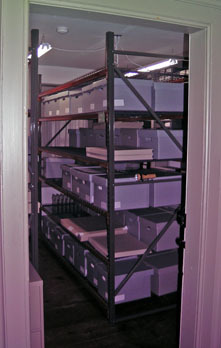 In 2007, the NHA received a Pennsylvania Historic and Museum Commission (PHMC) grant to pay for 50% of the costs associated with new archival storage containers, files, tissue paper and shelving. In 2008, we completed the assembly of the shelving, painted the storage room, and filled the shelving with the boxed items. In the process, additional storage space was created in the Thornton Hicks House attic for materials that are not regularly accessed. In 2005, the NHA had a preservation assessment survey performed by the PHMC Technical Assistance Grant Program to evaluate our archival storage facilities at the Half-Moon Inn. The survey gave us a good review for our facility and suggested that we acquire more storage space and archival storage boxes. This survey provided the foundation for our successful grant application. We are indebted to the volunteers who helped catalog, prepare and box the items for this project. We are seeking donations to help acquire an oversized scanner as the final phase of this project. 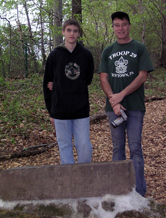 In 2008, the Newtown Historic Association (NHA) helped coordinate an Eagle Scout project for the restoration of the Cocoonery marker and the establishment of a walking trail, which is located on property owned by the George School. In 1934, a George School history group led by Walter Mohr (1889-1978), head of the history department, took an interest in the old cocoonery and located the foundation walls. A brownstone marker was put in place commemorating the discovery and pointing to the site of the famous local cocoonery. Over the years, the stone marker was toppled and forgotten, lost in the building of the Newtown Bypass and the later development of the surrounding farm land (Refer to the January 2007 Half-Moon article for the full history of the Cocoonery). You can visit the marker by following the walking trail located at the George School. Park near the athletic fields and follow the cross country route, looking for the Cocoonery trail sign.